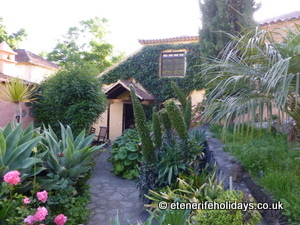 Finca Las Llanadas is located in rural North Tenerife. The finca is owned by a lovely lady Maria; she inherited it from her family. The finca was originally a farm which Maria and her husband have turned into three cottages each with a double bedroom, and one gorgeous farm house with two double bedrooms. There are pretty well kept walled communal gardens, and each cottage has a private terrace with garden furniture. 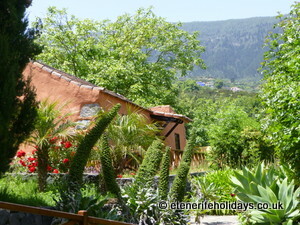 When we stayed we had our breakfast on our terrace looking towards the pine forests in the mountains. 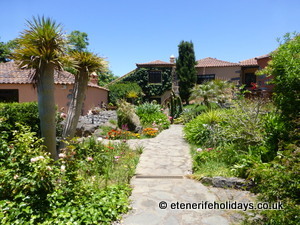 If you like nature you will be in your element here staying in the peaceful and quiet countryside of Tenerife. One morning while having our breakfast we watched a large bird of prey at work circling above also on the lookout for some breakfast! One of my best memories was looking at the sea of white clouds level with the garden. It is a strange sight, and can give one the impression you could just walk across the garden onto the clouds, also a reminder of how high up we were. Las Llanadas is located high above the stunning La Orotava valley. The historic town of La Orotava is home to some of the oldest buildings in Tenerife, and we do recommend a visit there. Other features at the cottages are a shared BBQ, hot tub, sun loungers, and off road parking. The cottages have been awarded four Espigas by the Spanish rural tourist association, ASETUR. During the day you may see the gardener around, the whole place is well kept and looked after. In our business we stay where we recommend our clients to visit. These cottages with their comfortable rustic interior furnishings are ideal for walkers, hikers, and couples wanting a quiet romantic break. Maria told us that group bookings are popular with several couples staying or a family sharing the Finca. On arrival we were warmly greeted by Maria who showed us around, and made sure we had everything we needed. Maria lives with her husband in the nearest town Los Realajos about 30 minutes’ drive away. You will be given her contact number in case there is anything else you need to ask during your stay. I remember Maria left us milk, water, a bottle of wine, and some fruit. The cleanliness of the cottages is of a high standard with crisp white bed linen and cosy throws on the beds. There is a small village about a 2-minute drive away. Here you will find a small store selling bread, pastries, milk, and other basics. We found this very handy and I left the store with my groceries plus a carrier bag of bananas that the shop keeper gave to me. Also in the village is a typical Canarian restaurant with a bar, this appeared to be the meeting place for the locals. We were told the food is good and being a local restaurant you will not be paying tourist prices, however a few words of Spanish may help. It is all part of the experience of staying at Las Llanadas and not being in a heavily populated tourist area. A car is needed we can arrange this for you, we offer a competitive price with advice on insurance. We drove down to the coast in no time from the cottages, and in general used the car to look around the area, and collect food supplies. Contact us at enquiries@etenerifeholidays.co.uk for a price to stay at this very different location in the delightful Las Llannadas Cottages with an exceptional hospitality from Maria.